As I add content to my notes, it will also appear on their (read only) copy of my notebook. This means that all of my class notes are immediately stored on every one of my students’ Surfaces. 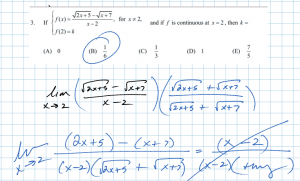 It also means that any kid can scroll back to another part of the notes that are no longer projected on the board. That way I don’t have to stop and scroll back up to a different section. Each kid can see what I’m presenting at the front of the room, and then scroll back to any other part they want to examine on their own Surface. By removing the requirement to transcribe everything I put on the board, each of my students will be able to spend more of their energy participating in discussions and understanding the material. Of course, students will be welcome and encouraged to take notes if it helps them focus and learn the material. Additionally, each of my students has shared their OneNote notebook with me that they will be using for all of their homework and miscellaneous notes. What this means is that they no longer have to send me anything, either via paper of digitally. Anything they put down in their shared OneNote notebook automatically shows up on mine. I can now watch as work is created in (just about) real time. In the evening I can comment on homework as it’s formed. During class I can show off great student work that was just created by going to that students’ notebook on my own Surface, which is being projected to the front of the room. So far the system has been working wonderfully. 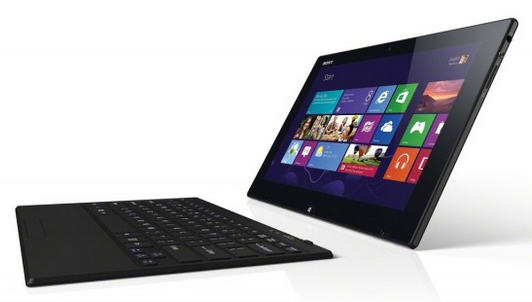 It takes a little bit of work to setup each notebook, but once each is setup, you’re done. Everything only needs to be setup once. Over the past 5 years I have been sharing my OneNote daily notes via PDF files that I would create after every class that would then be uploaded to a shared Google Drive folder. 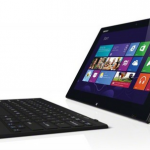 This system worked incredibly well in an environment where each student did not have a tablet with OneNote. I also can’t speak highly enough about supplementing any file sharing system with DropBox, a system that has been the crux of my past classrooms. If you’re working with iPads or in a non-one to one Surface environment, go with DropBox. 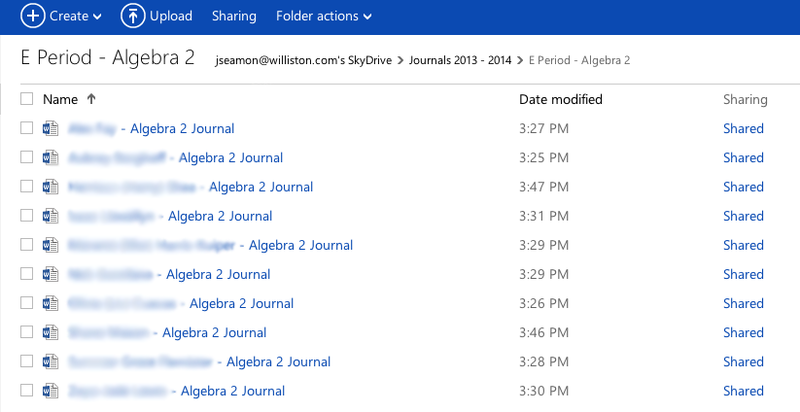 SkyDrive: I will be using the cloud storage system to coordinate all student journaling. I have created a private document for each of my students that only I can access. Every one or two weeks each of my students will answer the questions “How’s life?” and “How’s math?”. They are also free to use the journal to communicate to me anything they think I should know that doesn’t fit into class discussions or one on one interactions. By using an online, secure document sharing system, nothing will be lost and I will be able to easily read through 40+ journals. Note: Now that the OneNote sharing system is working so well, I may move student journaling to OneNote. 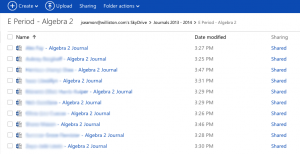 Each student could create a new section in their OneNote math notebook specifically for journaling. Schoology: My Schoology class pages will be the online hub for my classroom. Through them I will be distributing almost all class materials such as syllabi, assignment sheets, and worksheets. 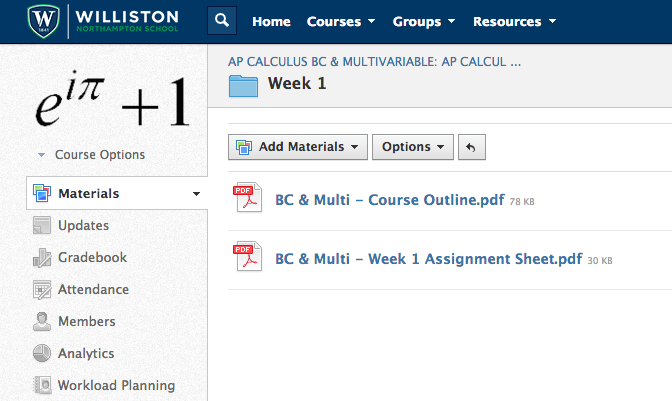 The system will also host our online discussions, as well as act as a class calendar. 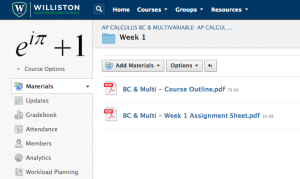 By funneling all course material through one online repository, my students will have easy access to everything we have covered, in a form that can be instantly loaded onto their Surfaces. Additionally, students will be able to receive grade updates through the Schoology system, and we will all be using much less paper. Twitter: I will be using Twitter for two purposes. First, I will be using it as a way to continually grow my personal learning network (PLN). There are so many wonderful resources out there and Twitter is the perfect pipeline to tap into almost all of them. Second, I will be using Twitter as a broadcast medium. I love being able to share my enthusiasm for math in the instant I have a moment of inspiration. 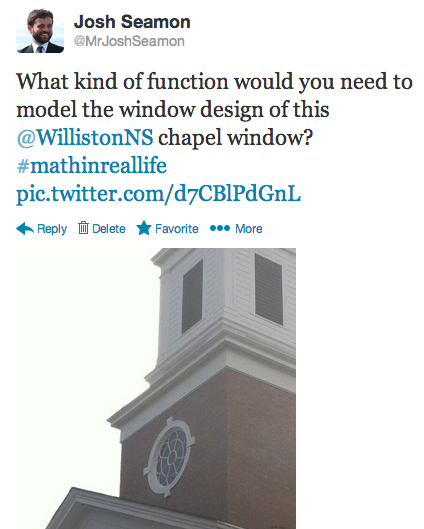 For example, I’d love for the hashtag #mathinreallife to trend! PollEverywhere.com: Live audience polling is a wonderful tool. 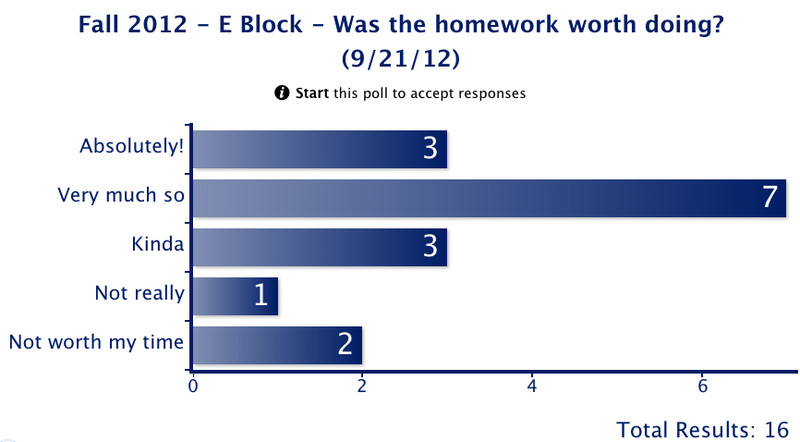 I use the system every day or two as my students enter the classroom, usually prompting them with the poll question “Was the homework worth doing?”. The students can cast their anonymous votes via text or online. Having a regular checkin helps me to better tailor my lessons to my students’ needs, as well as get my kids focused immediately after they walk into the class. It’s also a great way to start a conversation each day. These class videos serve a few purposes. First, anyone who is absent can see what we covered. While watching no video can totally replace being in class, it definitely helps to be able to see almost all of what was done/covered. Second, anyone who was in class who wants a second (or third, or fourth!) look at the material, can watch it as many times as they’d like. 1) I want it to be as frictionless as possible, primarily for the students, but also for me. Yes, my students need to understand how to use technology effectively, but they shouldn’t need to know how to update audio drives and play with video compression codecs in order to make a screencast. 2) The benefits of using the technology have to go, at least, a little bit beyond just replacing an existing non-technology based tool. It can’t just be using technology for technology’s sake. For example, requiring my students to do their home and take (some) notes in OneNote means they don’t have to carry around lots of big binders. Adding on the ability to share their notebooks and mine with each other in real time brings a benefit we could never realize without the technology. 3) You don’t know what you don’t know. I always try to keep my mind open and work towards finding ways to leverage technology to revolutionize my classroom. It’s a grand, perpetually rewarding journey. I encourage everyone to dive right in. 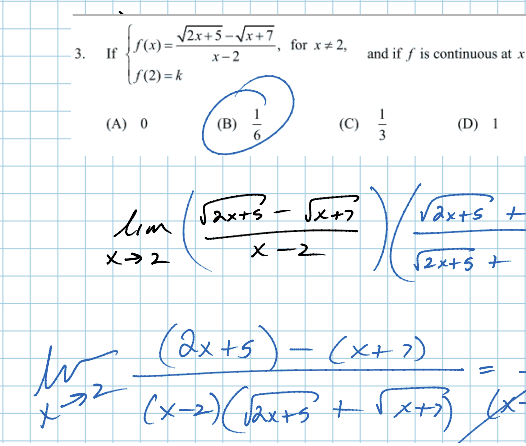 As s high school math teacher, I am also looking for ways to improve and enhance my students’ educational experience. Your passion for teaching is evident, and the information that you provide is understandable and useable. thank you! Thanks! I’m glad you found the information useful. Definitely let you know if you have any questions. Comparing Schoology and OneNote is a bit tough because they are meant for different things. Yes, they can overlap a bunch, but the true power comes from leveraging each for what they (alone) do best. It all also depends on what kind of device you’re moving to. 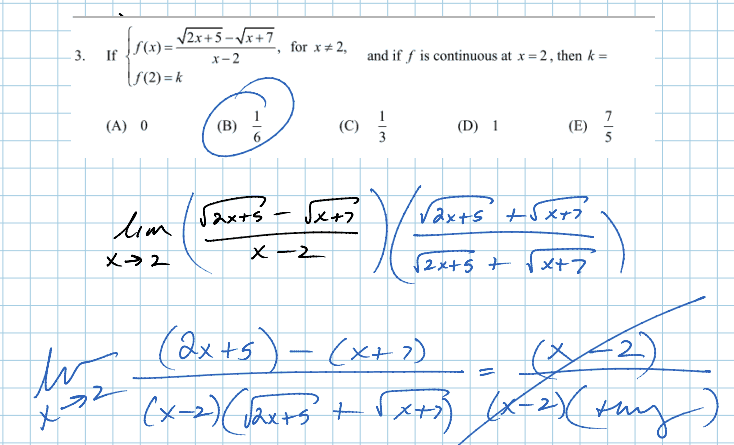 OneNote is totally indefensible for us since we went 1:1 with Surfaces. The ability to take handwritten notes, combined with the sharing system of OneNote is, after only 2 years, totally ingrained into life at Williston. What device are you going with for you 1:1 environment? We also need an LMS (Learning Management System), so we went with Schoology. The LMS was used for class web pages, resource libraries, assignments, grade reporting, etc. Yes, you can share documents through OneNote, and share them well, but there is certainly a time and a place for Schoology doc sharing. Also, there’s all the other stuff listed above that Schoology does that OneNote doesn’t. We have now moved from Schoology to Veracross since we can tie Veracross to our school database system and also now use it for alerts and much more seamless communication across lots of constituencies.